What's Your Fave Pick Among These 5 Beautiful Outfits From KP? 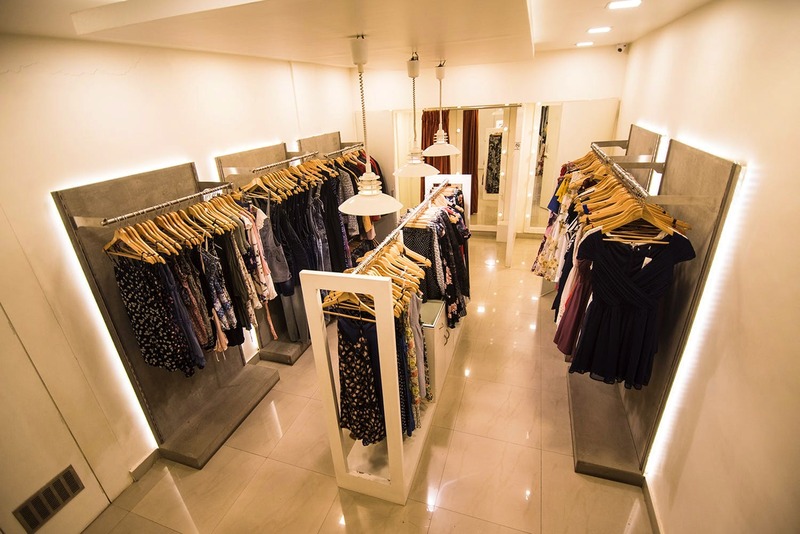 North Main Road and Lane 6 in Koregaon Park are full of boutiques, stocking the latest in fashion. We went shopping for a few outfits at different boutiques – and guess what? We found stylish outfits that are not only uber-chic but also reasonable. Pick your favourite look. Have an awesome party to attend but cannot decide the place to shop? Make a stop at Bella in Koregaon Park which will help you up your bling game. You can ditch the usual dresses and pair up your fancy crop tops with cute skirts and add jackets. This winter, you can up your style with smart leather jackets that are available in dark colours. This jacket is an absolute classic and will go well with any outfit of yours. Style Republic’s fancy display of embellished jumpsuits and gowns caught our eye. We came for the bling, and stayed for the clothes! Among our finds were a teal blue dungaree-skirt for INR 1450, paired with a three-quarter sleeve white t-shirt for INR 750; a strapless white crop top with ruching These outfits felt vacay-ready to us, and we think they’d be great options for a relaxed weekend away from the city. Cupid is stocked to the brim with clothes in a multitude of sizes – and at affordable prices, too. We picked a really cute mustard-yellow strappy dress with white flowers – worn over a t-shirt – for INR 1250; a pretty blue off-shoulder dress with a crochet-style hem and silver detailing for INR 850; and a trendy monochrome patterned jumpsuit for INR 850 with a waist-cinching gold and black belt for INR 650. They’re light, pretty, and good for events like a casual lunch with your girls, or a romantic date night. They also had plenty of belts and jewellery to accessorize your look – priced between INR 350 to INR 850. Get a glimpse of Jaipur in this tiny studio situated in Koregaon Park which houses an exquisite collection of clothes, specially curated from Jaipur. Naksh Jaipur on North Main Road is all about beautiful kurtis, long skirts, dupattas and suits, printed palazzos and tops. For fans of leheriya and bandhani work, they have beautiful skirts and stoles just for you starting at INR 1450. A pretty Aztec-print maxi dress (with pockets, yay!) at Envy caught our eye – priced at INR 2399. The selection of clothes there was a bit more limited than some of the other boutiques, but we also found a nice beige printed dress with an asymmetrical hem for INR 1350, and a multi-strand blue beaded choker for INR 850 to accessorize it with. We thought these dresses would be super for a smart work event, or even a lunch party.